By LMFAO featuring Lauren Bennett. Arranged by MJ Summer. Sheet Music Single. 8 pages. Published by EnjoyPianoMusic.com, LLC (H0.128211-219485). The most memorable themes from this song were extracted and arranged for pianists with just a few months of lessons who want to rock on! 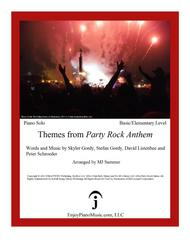 Visit EnjoyPianoMusic.com for more arrangements of piano students' favorites and popular titles.